All of us at the Tangipahoa Parish Sheriff's Office are concerned about the safety and well-being of the residents of our Parish. The security and protection of your family, friends, homes and property is the top priority for us all. Part of the mission of the Tangipahoa Parish Sheriff’s Office is to provide the highest quality of public safety services to our community. We feel one of the best ways of accomplishing this is by reducing fear and preventing crimes through education and heightened awareness of our citizens. Citizens partnering with law enforcement and citizen participation is one of the most effective tools against fighting crime because the job of stopping burglary, larceny or criminal activity is impossible for the Sheriff’s Office to accomplish alone.The Neighborhood Watch Program has proven to be one of the least costly and most effective tools to combat crime. Sheriff Edwards wants to encourage you to get involved in your local Neighborhood Watch Program today. The Neighborhood Watch Program teaches the techniques to recognize suspicious activity in your area. With the help of the sheriff’s office and the training that is offered, you can make your neighborhood resistant to crime and terrorist activity. "A good neighbor is the most effective crime prevention tool ever invented." states Edwards. Neighborhood Watch is more than just a program, it’s a network of neighbors trained by crime prevention deputies in home security, recognition and identification of suspicious persons and/or activity. Neighborhood Watch is an “observe and report” type of program. Members are encouraged not to stop and question people, but to observe and report suspicious persons / activity to the Sheriff’s Office. In today’s society, many families have working parents and have children involved in many activities that keep them away from home. It’s important for us to know our neighbors to prevent the homes in our neighborhoods from being a prime target while its residents are at work or involved in children’s activities. Neighborhood Watch works. It is a positive and effective way for good neighbors to help one another keep an eye one other and their property. In communities that have an active Neighborhood Watch there is a decrease in burglaries and related offenses where members report incidents to the Sheriff’s Office. Neighborhood Watch brings a community together and serves as a starting point for e orts that address other community concerns. A criminals job gets a lot tougher in a neighborhood where people are watching out for each other! For more information about the Tangipahoa Parish Sheriff’s Office Neighborhood Watch Program, please contact Lieutenant Alex Richardson at 985-507-2188 or visit our website at www.tpso.org. • Someone looking in windows of houses and parked vehicles. • Property being removed from houses where no one is at home or from a closed business. • Vehicles moving slowly through the neighbor- hood or people sitting in parked vehicles near or at a residence. Form a Neighborhood Watch Group in your community, and learn from deputy sheriffs how to observe and report suspicious persons and potential criminal activity. Make your neighborhood a hard target for criminals. 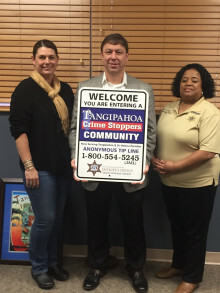 Neighborhood Watch is a FREE program provided by the Tangipahoa Parish Sheriff’s Office. This program is an opportunity to promote mutual understanding between citizens and law enforcement. Join our fight against crime by starting or joining a Neighborhood Watch program. You are the extra eyes and ears of law enforcement. We will teach you how to observe and report suspicious activity. Through our mutual communication, we can make your community a better and safer place to live. The best crime prevention device is a good neighborhood. The security steps you and your neighbors take as a group are just as important as the things you do individually. The Neighborhood Watch program operates on the concept that effective crime prevention requires cooperation with law enforcement. Neighborhood Watch is “neighbors looking out for the welfare of their neighbors.” It is a coalition of citizens who are concerned about the neighborhood where they live and are willing to become involved in the betterment of their community. It is only by working together that we can truly be effective in our fight against crime. We in law enforcement can do a lot to prevent crime, both through intense patrol efforts and educational programs. However, all this can be ineffectual if you do not do your part to deny the criminal the opportunity to commit a crime. It takes three ingredients to make a crime: desire, ability, and opportunity. Take away any ingredient and the recipe will fail; there will be no crime. Properly locked doors, neighborhood awareness, reporting suspicious persons or activity, identifying your valuables, all deprive the would-be criminal of an easy target.